As winter got underway, I started to consider whether I should get a second car. My reasoning was it would cut the mileage on the family Toyota (I don’t use the bike on snow or ice days, I might be British, but I’m not that crazy) and would limit inconvenience to the family when I had to take it for the day. Secondly, I wanted to take the strain off my Ninja 300, which was clocking up nearly one-thousand hard commuter miles a month at peak use. I really didn’t enjoy how much work it was in winter time; it isn’t the easiest bike to keep the weather off, and it’s surprisingly heavy on consumables like tyres and brake pads. Maintenance could be stressful if there were delays due to parts, my incompetence, or visits to the shop. It could really disrupt my transport arrangements, not to mention piss off my ever-supportive wife when I have the car for days on end. I quickly dismissed the idea. I didn’t want to pay for another one; I could scarcely afford something decent, anything I could afford would become a maintenance money-pit (been there) and I would resent the thing for the majority of the year when I wouldn’t be using it and it would be sitting in the car park eating money. It had to be cheap to purchase and run. Simple to maintain and clean, the former more important than the latter. Suitable for the rough winter pavement conditions present in Western Pennsylvania. I’d been reading a lot about the various offerings from China, with the knowledge that you get what you pay for, and an awareness of the strong prejudice toward Chinese kit, but I’d been impressed by the commitment of CSC Motorcycles in California. They’ve built something of a reputation for selecting good bikes from Zongshen (a giant Chinese manufacturing concern) and applying some American customer service know-how with the proviso that the owner is part of the process (no dealer network, you wrench the bike with support from CSC). I’d been through a lot of wrenching with my Ninja, including the hell of shimming the valves, so I reckoned I could handle it with enough support and reading. CSC’s best-known offering nowadays is the RX3 Cyclone, a 250cc adventure bike which has carved out a market that was practically non-existent in the US. However, the RX3 was not in my plans. It was a out of my budget (although clearly outstanding value) and a little too similar to my Ninjette in terms of my needs. I would probably replace my Ninja with something like an RX3, not supplement it. The CSC TT250 dual sport motorcycle is rewriting the definition of affordable quarter-liter enduro riding! Featuring a digital speedometer (new for 2017), counterbalanced air-cooled engine and 5-speed transmission, the TT250 was identified by Motorcycle.com magazine as the best motorcycle value in the US! 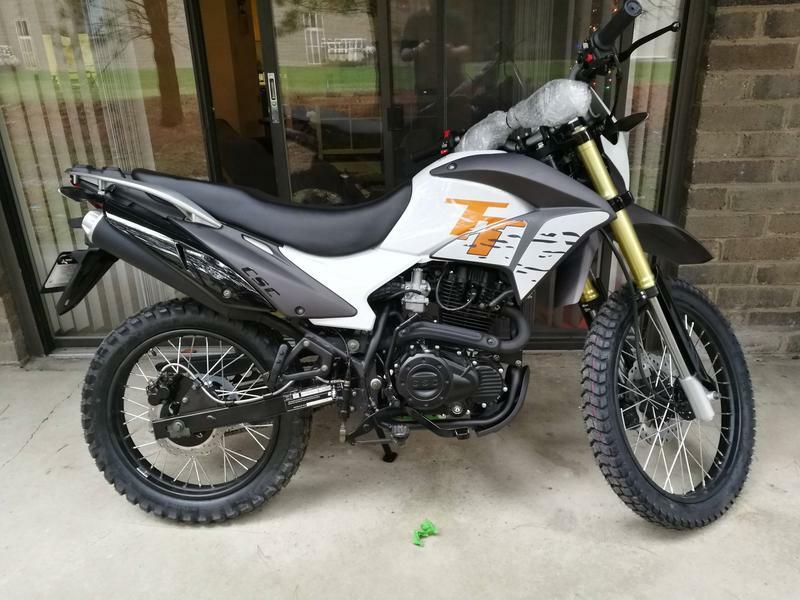 The lightweight TT250 has 18-inch rear and 21-inch front wire wheels, knobby tires, hydraulic front and rear disk brakes, inverted forks, adjustable suspension front and rear, a 300-watt alternator, handlebar-switch-controlled underseat accessory outlets, and more. The TT250 is perfect for riding around town or around the world on both paved and unpaved roads. When coupled with CSC’s free Service Manual and online maintenance tutorials, the simple-to-maintain and highly reliable TT250 is a great motorcycle! I had actually toyed with buying a TT250 not long after they were released much earlier in the year, just for the hell of it, perhaps as a gateway drug into a different kind of riding. I hadn’t considered it would make a really good second bike in its own right. I pulled the trigger one Saturday night over a few beers, and went for a great end-of-year deal. I’d considered waiting, but I didn’t know when CSC would get the 2017 consignment, and if they would have any issues – the 2016 model was now a known quantity. The snags had been worked out (minor things like the occasional wrong countershaft sprocket, or the odometer being in KM). Plus, it was nearly Christmas and my birthday, so screw it. Retail therapy. One week later on a chilly December morning, a truck turns up outside and deposits a tidy-looking crate in a parking space I’d set aside for the purpose. I eagerly got to work hacking into the cardboard and freed the bike rolling it around to my patio. The bike ships ready to roll, with a small amount of petrol (I assume from a test engine-firing and drive) and a crank case full of 10w30 engine oil. You only need to attach the mirrors. The CSC TT250, in the fastest colour. First impressions? Build quality is good. I would happily say the fit and finish is as good as my Thai-manufactured Kawasaki. It looks the business. No loose fasteners, and the bike had been prepped properly. I wasn’t sure about the tyres, they had the look of ‘just good-enough no-name OEM rubber’ to me, but I’d soon learn that things aren’t always what they seem. Was there any China showing? Not really. Some of the plastics like the muffler guard and the fork covers appear a little shiny and cheap, but they are sturdy. A couple of design details are telling,- the rear brake master cylinder and pedal assembly is a bit clumsy, the shift lever is long and ungainly-looking, and some welds though solid enough look a little rough to my untrained eye. Generally though. this is a well put-together bike. The hand controls and switchgear are well made; the levers have no slop or play, and the throttle action is superb. The engine looks gorgeous with its smooth black finish. As ever, paperwork is the boring part, and a nice lady at CSC does the hard work for you and sends you everything you need to make registering the bike as painless as your state’s bureaucracy allows. I hadn’t done this before, and I ended up going through a tag notary, sucking up the fairly high fee as the cost of getting it done quickly. I got my plates same day, and was ready to ride. More of that in part two!